As the skipper of Galileo 3, a 30-foot sailboat on the Columbia River, I tell my crew that I am comfortable with 15 feet of water under the keel, get nervous when it drops below 10 feet, and take immediate action if it drops below 6 feet. That’s because I cannot constantly monitor my chart to avoid running aground. So, I was amazed to find out that the huge cargo ships that navigate the river for 100 miles from its mouth at Astoria to the Port of Portland sometimes have as little as two feet of vertical clearance. 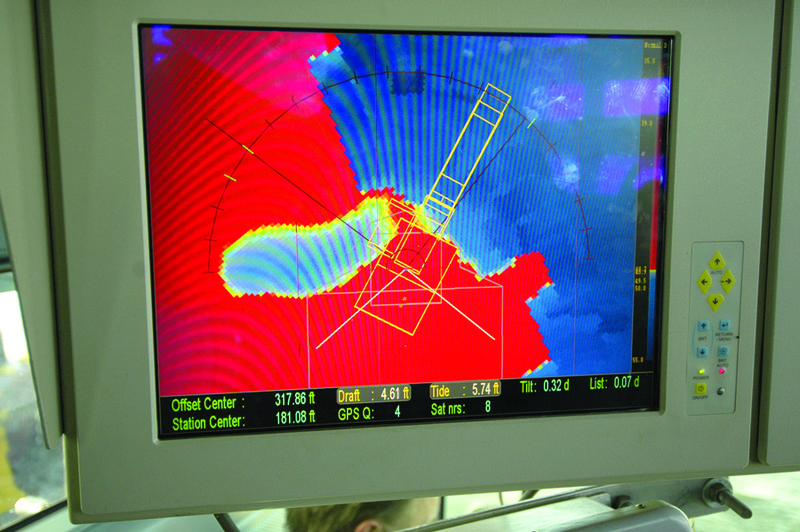 This feat of navigation is made possible by the knowledge, skills, experience, and electronic equipment possessed by three sets of marine professionals who cooperate tightly: the river pilots who steer the ships, the hydrographers who survey the river, and the dredge operators who maintain the required depth of the navigation channel. Maintaining a consistent minimum depth is essential to safe navigation. However, due to the very dynamic nature of the river’s bottom, keeping it navigable requires an endless cycle of surveying and dredging—a Sisyphean task costing more than $50 million a year. 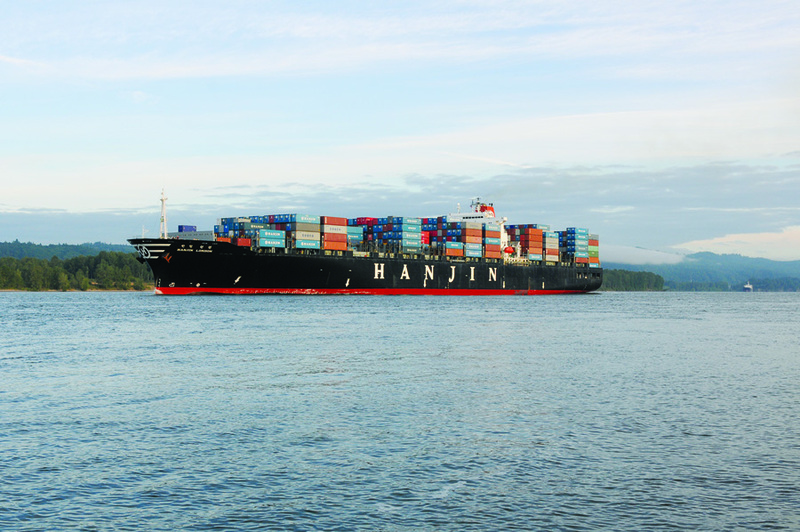 The Hanjin London cargo ship, capable of carrying about 67,000 metric tons, transits the Columbia River channel on its way to the Port of Portland, the fourth-largest port on the West Coast. The Port of Portland was created in 1891 by the Oregon Legislature to dredge and maintain the Columbia River channel at a depth of 25 feet. 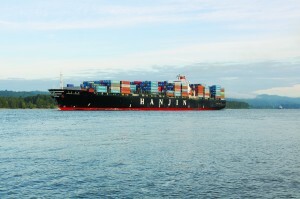 It now operates the fourth largest port on the West Coast as well as PDX international airport. The channel is now maintained at 43 feet of depth and a width of 600 feet, from Portland Harbor to the mouth of the river. The depth was increased from 40 feet in 2010, due to pressure from commercial interests, because each additional inch of draft allows a cargo ship to carry additional cargo worth up to several million dollars. 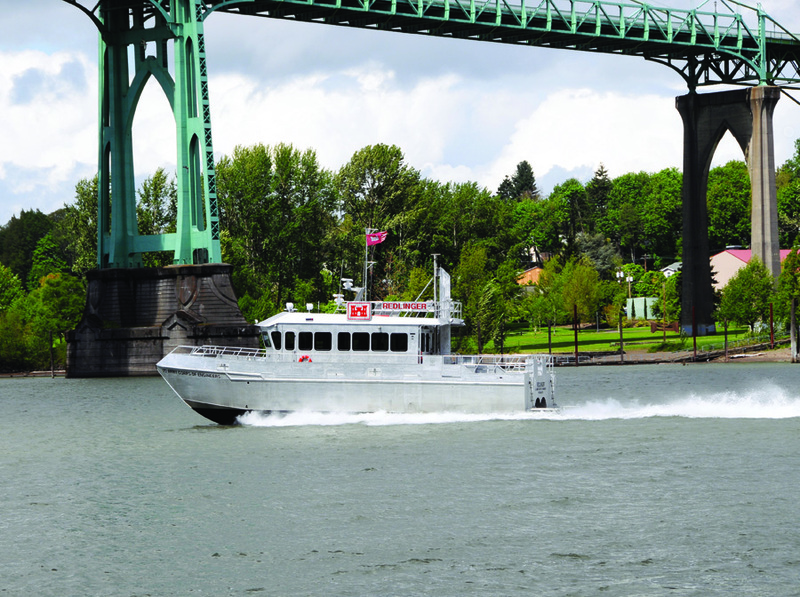 The Columbia River pilots are usually the first to notice shoaling along the navigation channel, and they promptly report it to the Portland District of the U.S. Army Corps of Engineers. USACE surveys the navigation channel and, through its project managers, passes the information to its two dredges and to one operated by the Port of Portland under contract. After dredging is accomplished, the survey boats go back in to check the channel depth. Every day, USACE posts fresh survey data on its website that the river pilots use routinely and is freely available to the public. It also coordinates very closely with the U.S. Coast Guard, which is responsible for issuing notices to mariners. The pilots work very closely with the USACE, Amos confirms. “We meet with them at least once a month throughout the year and go over the most recent surveys for the entire river. The information on the surveys is combined with reports I receive from pilots on the route. 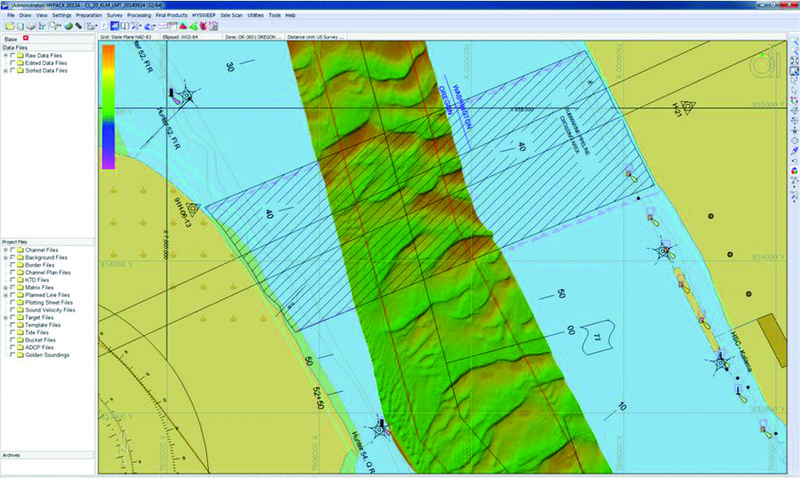 We examine all shoaling and discuss the best way to proceed by prioritizing the problem areas to create a dredging plan based on best available information. USACE is authorized by Congress to maintain the nation’s federal navigation channels for commerce, national security, and recreation. Its first mission, eliminating impediments to navigation on the Pacific Northwest’s rivers, dates back to 1871. The Portland District now manages 485 navigable river miles in the Columbia River Basin and also routinely supports the dredging needs of other districts along the West Coast and in Alaska and Hawaii. For this navigation mission, the district maintains four survey vessels and two hopper dredges, which are seagoing vessels designed to dredge and to transport dredged material to open water. The Redlinger, one of four survey vessels owned and operated by the Portland District of the U.S. Corps of Engineers, surveys the Columbia and lower Willamette rivers. The Portland District’s survey vessel Redlinger, a 59-foot hydrofoil-assisted catamaran with a waterjet propulsion that makes it exceptionally maneuverable, provides a stable platform to monitor channel and harbor conditions and provide high-quality surveys of areas in need of dredging. It operates in any kind of weather over about 115 miles of the Columbia and Willamette rivers. 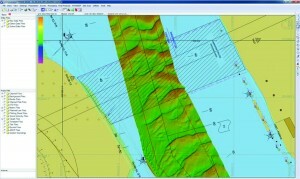 a computer system with HYPACK hydrographic survey software. Stewart looks for shoaling using both of the echo sounders, which are attached to the bottom of a tower that extends 4.5 feet below the boat’s waterline when deployed. They are accurate to within half a foot and provide soundings 10 times per second. “When we run a multi-beam, we are basically painting the bottom,” he says. “With the single beam, we will usually run channel lines, up and down the river. It just depends on what they need to see in the office for their volume computations.” When he is pointing the beam at a 45-degree angle, its swath is about two times the depth. To perform a Class A survey, he points out, they slow to less than 10 knots. For conditional surveys, however, the requirements are looser and they can go faster. In a typical day, the Redlinger will cover seven lines, each about three to five miles long. Stewart also keeps track of the speed of sound in the water, using data from the sound velocity probe, and adjusts his soundings accordingly. Stewart edits an XYZ file adjusted for tides, heave, pitch, and roll and sends it to the office, where they use it to calculate the volumes of sand that need to be dredged. It then plots these volumes on a chart and sends it to the dredge. On the day I spent a few hours on board, the Redlinger was conducting a regular, seven-line, single beam conditional survey, up and down the river, checking for shoaling. Whenever it approached a tide board, the crew slowed down and approached it to read it, so that Stewart could subtract the tide from his soundings. One of the two hydrographers at the office (or Stewart) produces a survey line, using HYPACK. The operator then keeps the boat as close as possible to that line—while also watching for underwater obstacles and surface traffic (ships, kayaks, etc. ), monitoring radio communications and engine gauges, and periodically alerting Stewart to changes in engine RPMs. This is an exhausting job requiring a lot of concentration, as I experienced during 20 minutes at the helm. Like most pilot groups, Columbia River pilots carry Portable Pilot Units (PPUs), laptops loaded with custom-made software for the Columbia River System, which serve as a Vessel Traffic Information System utilizing the Automated Identification System signal from other vessels. The PPU program for the Columbia River pilots was developed for them by the Volpe National Transportation Center in Cambridge, Massachusetts. 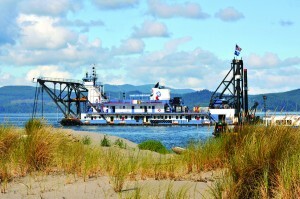 The dredge Oregon operates around the clock, six days a week, typically from June through January. The Port of Portland owns and operates the dredge Oregon, which maintains the Columbia River navigation channel on behalf of USACE and other ports in the region. 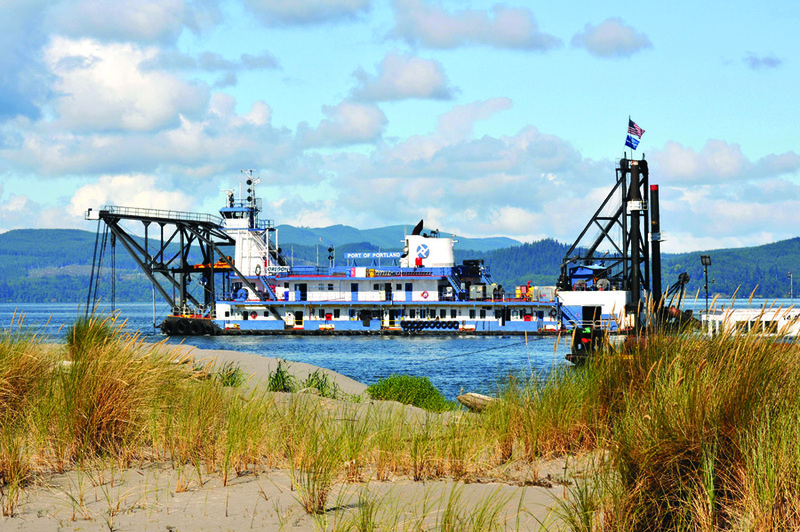 The dredge operates around the clock, six days a week, typically from June through January each year, working from the Columbia River bar to Portland Harbor. The dredge is propelled by two huge spuds at its stern, so it moves forward slowly while swinging from side to side. “We are doing a series of arcs down the river,” says captain Mark Stillwell, who commands the dredge’s 45-member crew and has a 35-year nautical career. While the channel is officially 600-feet wide, the dredge clears an “over-width” of 50 feet to 100 feet. “This allows six months of time while we are off the river,” he says. How much it can dredge each day depends largely on the slope of the river bank. This season the distance traveled varies from 250 to 800 feet in a 24-hour period, moving an average of about 25,000 cubic yards in that same time interval. To relocate the material it removes from the bottom, the dredge uses pipes in sections 60 feet to 100 feet long, which are constantly repositioned as the dredge moves, and a pump powered by a 5,000 HP engine. The dredge’s cutter head, powered by an 800 HP engine, is attached to the end of an 80-foot “ladder” that protrudes from the bow of the vessel and is suspended by cables. The leverman, who operates the cutter head from the top of the dredge’s tower, continuously adjusts his swing and depth on the basis of such variables as the tide and the vessel’s pitch. Because the dredge’s survey-grade depth sounder is on its bow, it is always behind the cutter head, though by less than the length of the ladder, which is deployed at an angle. Articulated bucket dredge owned and operated by J.E. McAmis for the U.S. Army Corps of Engineers. To tie the bathymetric surveys to land surveys of the islands created by the dredge, the Port’s surveyors use the Columbia River datum. “It is a sloping datum for the Columbia River, and all of the sites are tied to that,” says Anderson. 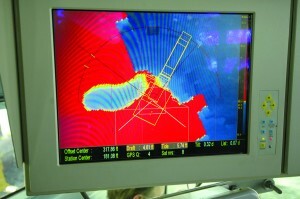 Pre-dredge survey of a section of the Columbia River. 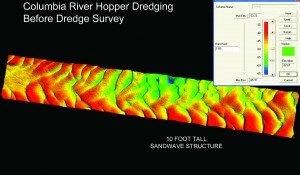 Hydro survey data collected by the U.S. Army Corps of Engineers. 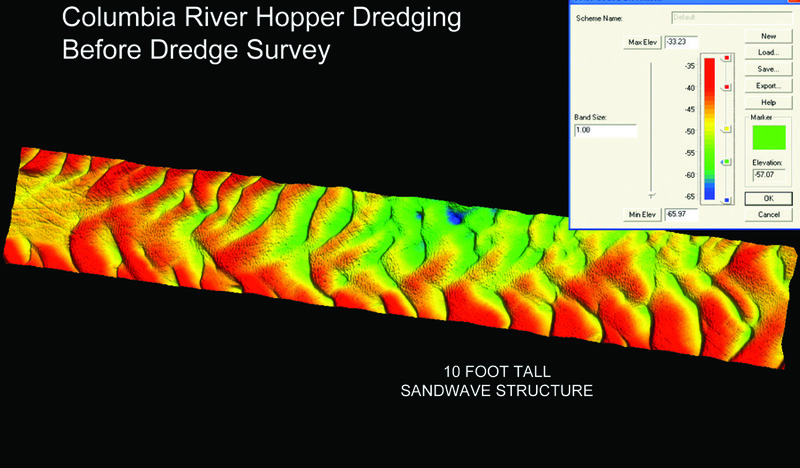 “Our survey really helps the levermen understand how to control the dredge, how fast they should be swinging, and how much material is in front of them,” Anderson points out. To conduct his hydrographic surveys, Brennan uses a 27-foot boat with a single-screw inboard engine. “It has a single beam echo sounder and a WAAS GPS receiver with 3-foot to 5-foot accuracy, but we are probably within 1/10 of a foot vertically, which is more important than our exact position,” he says. I assumed it meant the whole river, from the bar to Portland. However, you might want to check with the Port of Portland. Is the $50 million a year the cost of the entire Columbia river? or just the Portland area? I am trying to figure out an approximate annual dredging cost for the Astoria area and am looking for comps. Thanks! I live on the Columbia river where there is continuous dredging going on., Woodland Wa. The dredging material is placed about 2 miles down the road from our neighborhood, at NW Training. The Stordhal trucks go get their loads, then they go about 4 miles down the road ( again past our neighborhood) to the scale as the dredging and scale are 2 different locations. Back and forth all day long past our neighborhood, typically speeding. In the past the scale and dredging material were at one site, for some reason this has changed and double the truck traffic in our neighborhood. My concern and I hope there is a solution or a compromise of some sort: starting at 600am 6 days a week until 500pm +, Stordahl “truck and a pup” maybe 100 times a day past our neighborhood, noisy, vibrates my house, dust flies. This greatly hampers our way of life and enjoyment of the area. ( not to mention sleep)The neighbors, tourists, used to be able to jog on the road, bike ride, horseback ride, young women push their babies in their strollers, just generally enjoy the beauty. No longer because of the truck traffic, everyone is too scared to get on the road as we used to. I have lived here 14 years, this is a huge dissatisfier for all. I have made phone 4 phone calls to 4 different agencies for some sort of solution. Nothing, except, they have the right to do this, this will go on until Oct 2017 at least per contract with Stordahal trucking, how do I knw the trcuks are speeding, this is a federal requirement, to remove the dredging material. That is fine, but one must understand the impact this has on our neighborhood, per the above . My suggestion, please place the dredging material where it was dumped in the past, near Martins bar, where the scale is, this will greatly reduce the trucking noise, danger to us residents, preserve the area for what it was, beautiful. Thank you for any help. Hi Patti, I’m sorry to hear about your troubles. I suggest you contact Stordhal directly; I regret we do not have their contact information for trucking. Shelly, thanks for your response. I now understand that no one at your xyHt can do anything by posting on this site. But, I have called Stordahl trucking company and the dispatcher asked if I had a radar detector as I reported concern about the speed the trucks were going. I callled Cowlitz county zoning and treated rudely. I called the Cowlitz conty sheriff and was told “business is business” in response to at least can something be done about the speeding. Called the Army corp of engineers, DOT and of course the Port of Woodland 3 Xs as have other neighbors. I am appalled by the lack of foresight or concern about us residents and tourists who have enjoyed the area for years, it is all about the “importance” of the Port making money and “serving the community”, ( I guess our neighbor hood is not part of that)no concern for the rest of us that also serve the community through what we do for livelihood and in that require sleep and our down time. The Port of Woodland has a contract with Stordahls truck company until Oct 2017, I know between these 2 there is a solution if they would be willing, time will tell. Specifically, when I was asking for “historical” examples, I meant PRE-1914. THanks!